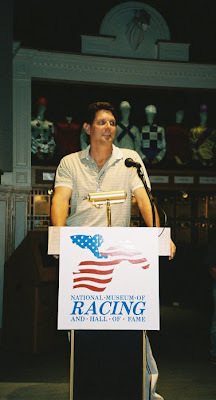 Ian McKinlay spoke at a Hoofcare@Saratoga event at the National Museum of Racing and Hall of Fame in Saratoga Springs, New York in August 2008, sponsored by Life Data Labs. You have two months to find your passport. Today the Ontario Farrier's Association announced the program for its 29th Annual Convention, to be held Friday March 27th and Saturday March 28th at Woodbine Racetrack, near Toronto, Ontario. “Understanding Equine Lameness” brings together two unique experts on the horse's foot--two professionals whose paths would normally not cross. Ontario native Ian McKinlay of Tenderhoof Solutions and Jeff Thomason PhD, anatomy researcher in the Department of Biomedical Sciences at the University of Guelph will be guest speakers. McKinlay has over 30 years in the equine industry and is known for his innovative techniques and products to successfully treat and prevent hoof lameness. Ian is one of the foremost specialists on hoof care in North American racing and is the man who cares for the valuable feet of racing superstars such as Big Brown, the 2008 Kentucky Derby and Preakness winner. Interestingly, Thomason was co-author of the research paper "Modelling horse hoof cracking with artificial neural networks", published in Canadian Biosystems Engineering/Le génie des biosystèmes au Canada (43: 7.15-7.22). In the study, the relationships between data on horse hoof crack damage and a number of other variables were modeled with artificial neural networks (ANNs), and a system for categorizing cracks on real horses was developed. Dr. Thomason is a leader in the study of equine biomechanics and equine locomotion. "For us to fully understand lameness issues it is important to understand the science of the equine hoof and Dr. Jeff Thomason is our guide," says the OFA in its announcement.